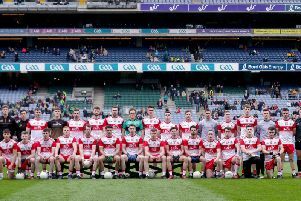 Derry Under 20 manager Mickey Donnelly has hit back at the personal criticism which has been aimed at some sections of the Oak Leaf management set-up. Speaking before Sunday’s Ulster final victory over Armagh, Donnelly said people need to start being positive about the county instead of believing opinions they hear on television. “The frustrating thing is that a lot of the negativity that gets aimed at Derry football has been quite personal but that only motivates us,” explained Donnelly. “The people its aimed at don’t deserve it and some of it has been very sharp and very personal. People need to realise these individuals are putting in serious effort and when Derry lose that annoys and frustrates them but it doesn’t stop the hours and hours of quality work they are putting in. “What I see at Owenbeg is an under 17 side in an Ulster semi-final, replicating the work we are doing. There is an under 15 side that I was lucky enough to see up close a couple of weeks back and are extremely talented. “It is very easy to be critical and it’s easy to be cynical. It’s easy to write everything off as being rubbish but I think until you are ready to get your hands dirty, put your shoulder to the wheel, then you can offer an informed opinion. “People need to start being positive about the county rather than buying into a public persona about everything being negative or nobody wanting to play for Derry - it’s a load of rubbish.